Dairy UK’s Northern Ireland Director, Mike Johnston, summarised the prospects for this sector at the agri-food seminar. Speaking at the recent agendaNi agri-food seminar, Dairy UK’s Dr Mike Johnston that the local dairy industry is fully committed to meeting the targets laid out within the ‘Going for Growth’ policy document, published by the Agri-Food Strategy Board earlier this year. 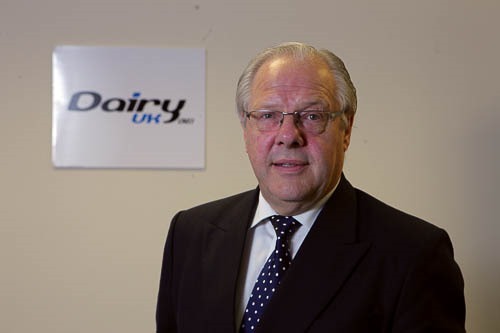 He added: “There are tremendous opportunities for the milk sector moving forward but it will require ongoing hard work and investment at both producer and processer level to ensure that these are secured. “Performance levels at farm levels must improve. Our top farmers are best in class regarding both profitability and efficiency levels. These are role models for other producers operating within the industry. Delegates attending the event were told that farmers are enjoying record prices with many dairy processers having full order books at the present time. In addition, the international dairy market has remained remarkably resilient over recent times and this despite the increased milk output now coming through in a number of countries. This can be attributed, almost exclusively, to the growth in exports of dairy products to China. This can be accounted for by a continuing growth in demand for milk and milk products in that country, allied to a 10 per cent fall in domestic output. Milk production in Northern Ireland is currently running at levels 7 per cent higher than this time last year. The equivalent figure for Great Britain is 10 per cent. International dairy markets look set to remain steady over the next few months. The big imponderable will be the scale of the spring milk flush in Europe. The fact that producers in the Republic of Ireland are mindful of a potential super-levy threat for 2013-2014 may well serve to dampen the scale of Irish peak demand next year. The one fly in the ointment at the present time is the growing strength of sterling, which is making our exports more expensive and imports from the euro zone cheaper. This reflects the growth in the UK economy as a whole. Significantly, Mike Johnston did not include farm gate milk prices as one of the factors that will impact on dairy farming profitability. “The reality is that milk prices can be extremely volatile,” he explained. “Yes, they are strong at the present time but the dairy industry knows only too well what can happen to dairy markets within weeks, never mind months. The reality is that dairy farmers can only control those factors that have a direct bearing on the production efficiency of their businesses. “This includes all aspects pertaining to cow and animal husbandry, forage use and the implementation of feeding programmes that minimise the wastage of inputs.